Beautiful decor & a fantastic Semi-Oceanfront location combine to make Nick O' Time a great choice for your family retreat to the Outer Banks. Loaded w/upgraded features including granite counter tops, 5 flat screen TV's including a 51 Inch LCD w/surround sound stereo in the living area, Private Swimming Pool w/large concrete deck & ample furnishings, screened porch, Ocean Views, & Hot Tub w/terrific views of the Wright Brothers National Monument. Bright, Caribbean colors & lovely furnishings are just part of what makes this very well maintained home such a fun place to vacation. The Beach is a short walk away (approximately 250 feet to the Prospect Avenue Beach access) & the Wright Brothers National Monument, dining, & shopping are all close by. A stair tamer is provided to get your luggage & groceries to the top floor w/ease (a $100 deposit is required for the stair tamer remote, refundable provided the remote is returned to our office). Ground Level: Parking for 4 Cars, Covered Entry, Stair Tamer Cargo Lift, Fish Cleaning Station, Gas Grill, Private Swimming Pool w/Over-Sized Concrete Deck, 10 Lounge Chairs, Table & 4 Chairs, Wet Bar, Commercial Ice Maker, Bar Area w/4 Bar Stools, & Enclosed Outside Shower. 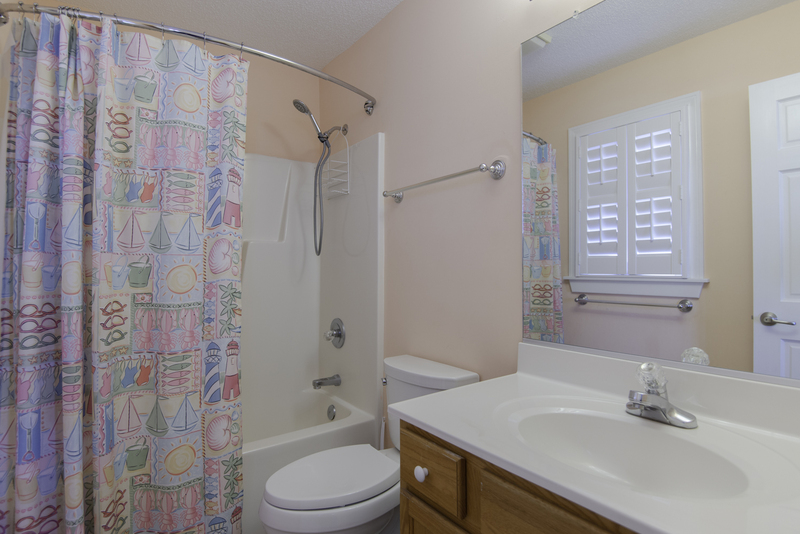 Mid Level: 3 Bedrooms (1 Master Suite w/Queen, TV, DVD, & Full Bath w/Tub & Shower, 1 w/Queen, TV, & DVD, & 1 w/2 Bunk Sets, TV, & DVD), Full Shared Hall Bath w/Tub & Shower, Laundry Area, Covered Deck w/Deck Furniture & Ocean Views, & Sun Deck w/Deck Furniture, Hot Tub, & Magnificent Views of Wright Brothers Memorial. Top Level: Living/Dining/Kitchen Area, 51 Inch Flat Screen TV, DVD, Surround Sound, Screen Porch, Covered Deck w/Deck Furniture & Ocean Views, & 1 Master w/Queen, Flat Screen TV, DVD, & Full Bath w/Tub & Shower. Features include: C/AC & Heat, Washer/Dryer, Dishwasher, Microwave, Phone, Fax Machine, 5 TVs, DVDs, DVD Library, Wireless Internet, Deck & Pool Furniture, Horseshoes, No Pets. This is a Non-Smoking Unit. We found the location to be wonderful and the kitchen to be very will stocked with quality pots. The pool area was spectacular and is a real selling point for us. We had plenty of dining space & "hang out" space in the living room on the huge couch! We really enjoyed how open the kitchen/dining/living room space were. The pool has little seats in the deep end-perfect to sit & relax. The hot tub was a nice big size! We liked that the lot next door was empty (quiet) & the option of horseshoes since there is no game room. FYI: The clothes dryer took a LONG time to dry clothes. Hopefully the owner got it repaired or replaced it. Sometimes it took 2 complete cycles to dry 1 full load. All in all, this was a great home, & we'd definitely consider staying there in the future! It is a very nice house. We had a wonderful time. Very nice home and comfortable to rent! It is a very nice house.